Our super soft mini squeegee is an ideal applicator for smaller graphics such as our visor and blood group decals, it features various contours and is very flexible, making it equally suited to delicate applications to intricate curves. This is our own 'Go To' decal applicator, supplied in yellow for easy identification and measuring 75mm x 60mm. 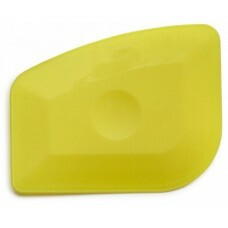 Our 'chizler' vinyl decal removal tool is made from a tough polycarbonate, designed primarily for re..